It's King of the Hill Dugtrio! That time Dale dug a tunnel under the alley, and the garbage truck collapsed it... good times. Now we know the real story! I like this, I tell you whut. OMG I DIDNT KNOW YOU DID KotH pics!!!! :V i love it! I can't help myself. :D And I should really re-watch that show sometime. Oh its one of my favorites! I already sent ur pic to 2 of my friends that love it too! Use your Z move: Pro-pain! I sell Pokeballs and Pokeball accessories! 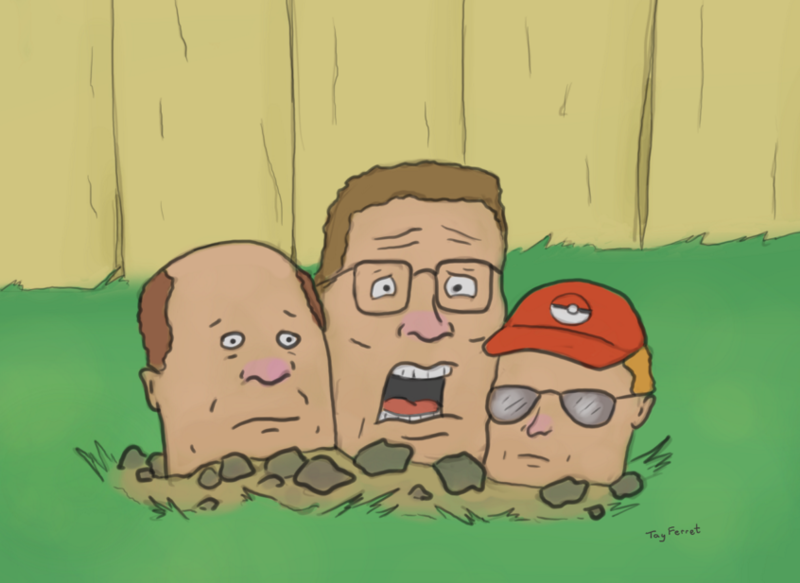 This is all fine and dandy, but just don't make a mountain out of a hank hill, aight? But I want to be king of the mountain! I hadn't seen that until now! This thing? https://inkbunny.net/s/1613009 I hadn't seen that until now!